Start your Beekeeping Business with low investment and earn more money. You can start business part time or full time. Starting your own business is a good idea in present time. Start business with any amount 20,000 Plus. You can purchase Italian bee colony of ten frame at the rate of 3000rs to 4000rs per colony in india. You can purchase bee colony from any bee keeper. You can also contact us for the bee colonies in india. 30 to 50 kg. 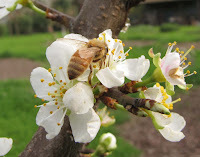 of honey can be harvested in a year or it depends on the flower and crops of the seasons. You are advised to learn from any bee keeper minimum three months how to manage apiary( bee colony ). Then you easily able to keep bees your own. You can sell your honey in retail or in whole sale rates. Retail rate for raw honey in india is 200 to 250 rs. per kg. and whole sale rate is 100 to 150 rs. per kg. and it depends on market prices. Export of honey is also a profitable business in india. In the market good demand of honey. Many medical companies are used large quantity of honey. It used in many medicines. It is very good to use honey in daily diet routine. Our motto is to serve peoples to earn through beekeeping. It is also a good for health and environment. Bee keeping is also a good school to learn how to work and manage our life. We learn many things from bees and bee keeping. It is a more profitable business with less hard work. We help youth to become a beekeeper with our knowledge programs and our services. Any one who want our help in the bee keeping project can contact us. We will try our best to help them. You can read regular our upcoming changes and new programs.